Hundreds of protesters took to the streets yesterday to protest America’s crooked tax system, in which the richest corporations and individuals avoid paying taxes and the rest of the country is left paying the bill. 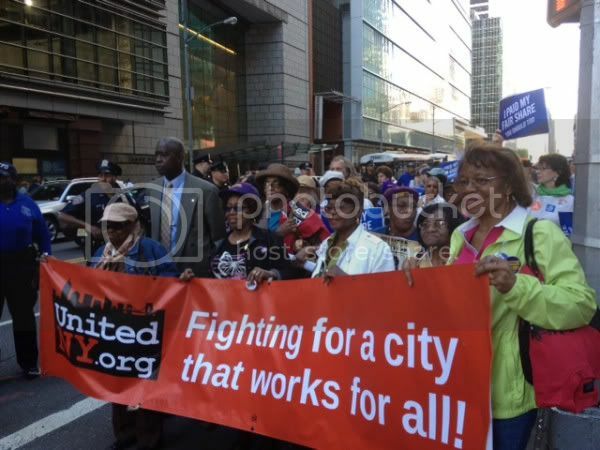 Hundreds of Tax Day protesters took to the streets in New York City yesterday afternoon to demand the “1 percent” and some of the largest corporations in the United States pay their fair share of federal and state taxes. 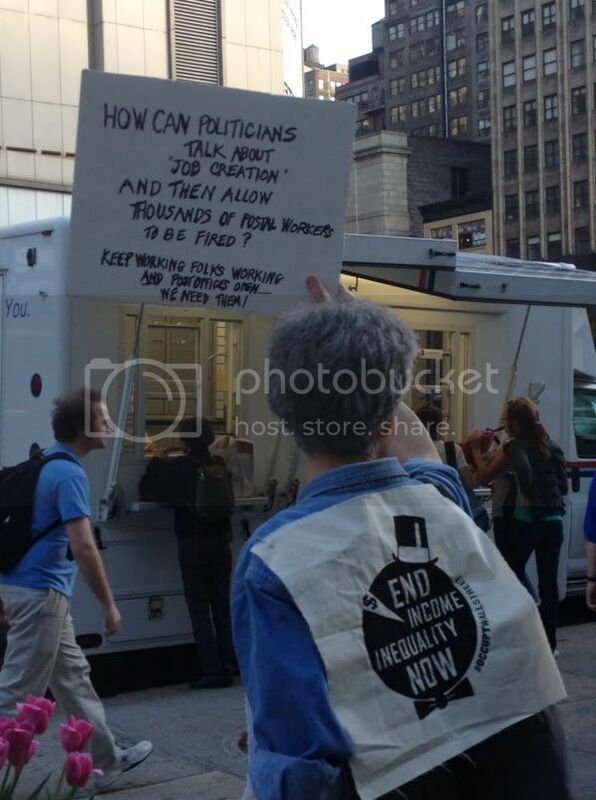 The event was organized by a broad coalition of progressive groups, including New York Communities for Change, the Working Families Party, UnitedNY and Students For Occupy Wall Street. “It’s time for the big banks and corporations to pay their share of taxes like the rest of us do. The Flatbush community cannot afford any more cuts to the services we rely on in order to line the pockets of the 1 percent. We’re not going to take it anymore. Today we’re fighting back,” said Leroy Johnson, NYCC chairperson of the Flatbush Chapter. 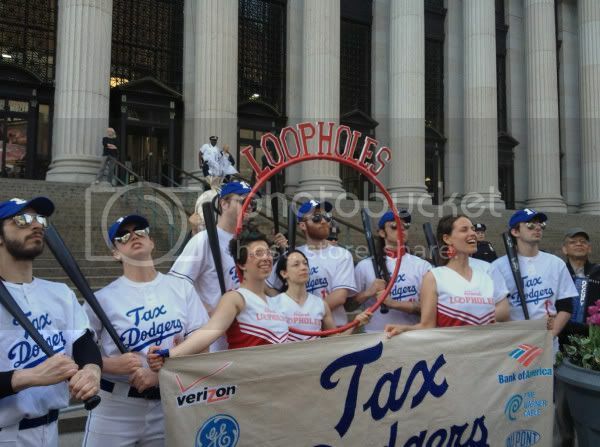 Protesters gathered by Bryant Park before marching toward the James Farley Post Office on Eighth Avenue, the procession being led by “loopholes and dodgers,” in honor of the major corporations and 1 percenters that pay little to nothing in taxes. Though the right’s favorite talking point is that America has one of the highest corporate tax rates in the world at 35 percent, this doesn’t take into account corporations’ tax-evading practices. The S&P is home to 115 companies that receive more in credits than they pay out. Bank of America, the fifth-largest corporation in the country, holds over $2.2 trillion in assets, and yet it pays less in taxes than the average American household. In fact, the federal government gave Bank of America $2.3 billion in 2009 while it made $4.4 billion in profits. Similarly, Verizon made $12 billion in profits in 2010 but had paid $0 in taxes for two years as of 2011, while spending $34 million on lobbying. It is this unbalanced system—where extremely wealthy individuals and corporations reap the rewards of rigging the US political system and tax code, while poor people are forced to sacrifice their already meager means—that inspired hundreds of protesters to turn out Tuesday. “Tax Day is about the citizens rising up against the big money crowd to demand that they stop ripping off the rest of us and start carrying their fair share of the tax burden. Otherwise we will rot as a nation, even if some wealthy people live glamorous lives,” said Dan Cantor, executive director of WFP. 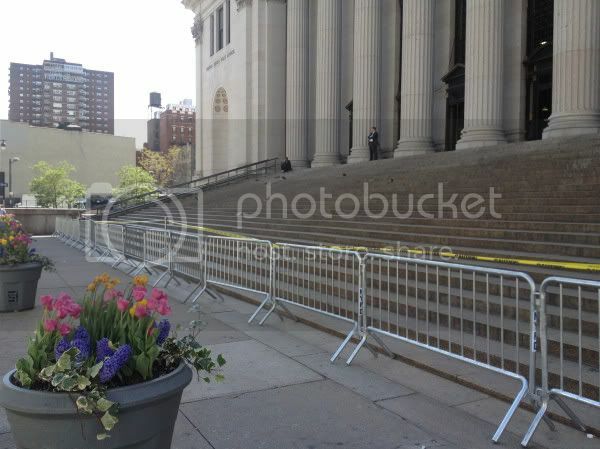 The NYPD clearly anticipated a large turnout because the steps of the post office were barricaded so no protester could touch a foot to the steps of the building. Somehow, despite the serious measures to seal off the steps (protesters were actually held in a kettle just shy of the post office), “loopholes and the dodgers” managed to get in front of the building and pose for a few photos. Meanwhile, it seems as though the financial elite simply don’t understand what this chatter about loopholes and tax-dodging is all about. Earlier in the day, some Tax Day activists protested outside the birthday celebration of Ann Romney, wife of Republican presidential front-runner Mitt Romney. Outside Trump Tower, where the party was being held, the Guardian spoke with Cathy Cyphers Soref, one of the party’s attendees, who just doesn’t get this “loopholes” business. Soref said she owns a philanthropic genetic research business that has generated $20m “modestly”. She claimed to have recently returned from a trip to Mexico, where she says she visited with the family of Carlos Slim, the richest man in the world. Soref believes America’s wealthy class has been demonized through misunderstanding. “I pay, our family pays, in excess, state federal and local taxes, probably 55%, no fooling,” Soref said. She argued that when George W Bush cut taxes for wealthy Americans, it gave her the freedom to launch a company that provides a service to society. A report from the nonpartisan Congressional Research Service found that when all federal taxes are taken into account—including those on wages, investment income and corporate profits—some households earning more than $1 million a year paid as little as 24 percent of their income to the IRS in 2006, which is a substantially smaller share than many middle-class families pay. “People are out here today to show their dissatisfaction with a government, and a tax system that favors the wealthy. The men and women who are gathering at today’s events are dealing with issues like foreclosure, cuts to educational, healthcare and social service programs, and other problems that arise when corporations and big banks don’t pay their fair share. We aren’t asking for much, just that our hard work is valued, and that these corporations who end up paying less than the average taxpayer, while accepting federal tax refunds, are held accountable for their actions,” said Camille Rivera, executive director of United NY.